Taking on added responsibility isn’t new to Darrin Everage. It's something he's quite used to. 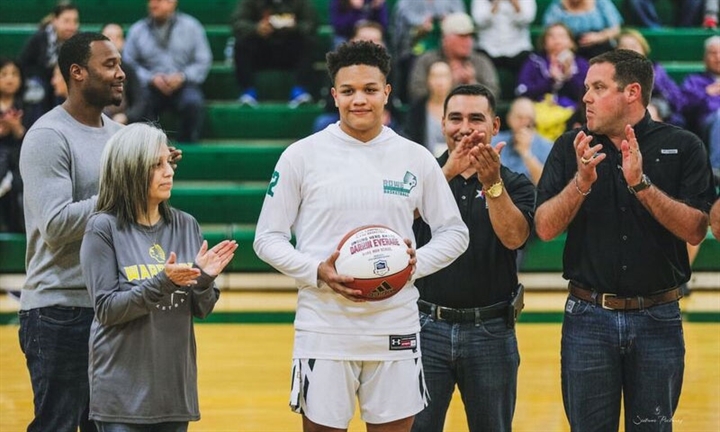 The junior guard for McAllen Rowe has had his hand in plenty extra-curricular activities so when head coach Jose Louis Yebra asked him to switch from forward to be the team’s primary playmaker at point guard, there perhaps wasn’t a more appropriate player to take on the burden. He took his new role in stride and has flourished for the 25-6Warriors. But it's his contributions to the community and commitment to academic excellence that earned him the right to be named an Unsung Hero by Texas Farm Bureau Insurance. To list just a few of his achievements, Everage is also on the Nikki Rowe Student Council, the Chick-Fila-A Leadership Academy, the Fellowship of Christian Athletes and a volunteer with the RGV Food Bank all while maintaining a 4.0 GPA. To add to his list of off-the-court duties, Everage is also a McAllen ISD Student Ambassador, a member of the National Honor Society, and a volunteer with Emily’s Meals and the McAllen Police Department Toy Drive. “It really teaches you responsibility,” Everage said. “In life that’s all it’s about, the responsibilities, you have to take care of things you have to take care of and being involved in all that, it’s really given me the opportunity to handle all those things and be a good person in general. Coach Yebra knew that Everage had the potential to be special after following him since grade school. His son, sophomore guard Louie Yebra, had played with Everage on the AAU circuit for some years now and was looking forward to eventually working with him at the varsity level. “It’s like having another coach on the court.” Yebra said about Everage's leadership. “When he’s out there, he knows what’s going on, he’s being a great leader as far as letting them know what to do when somebody has questions…his basketball IQ is very high, and he does a lot for our team in those regards. Yebra recalled a game against PSJA-North earlier in the season in the first round of district. Rowe won 67-66 with Everage leading the team in scoring. The next time around against the Raiders, he led his team by distributing. “Just for him to lead us in both games, he led in scoring at the point guard position in the first game and (the next game), just by doing what we asked him to do and deliver the ball to the people that were open and following instructions the whole game,” Yebra said. Both instances showed how Everage’s versatility on the court that equal only a fraction of his responsibilities off of it. The junior wants to continue playing varsity basketball in hopes of playing at the next level and pursuing his interest in automotive engineering. There’s one thing that’s for certain, if Everage maintains on his current path of academic success and philanthropy, he won’t have a lack of options of where he wants to take his future.